Morneau will be presented with the award in a pre-game ceremony on Monday, April 20 at Coors Field in Colorado when the Rockies take on the San Diego Padres. 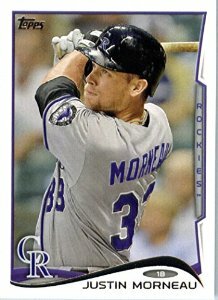 After 10 successful seasons with the Minnesota Twins and a little over a month with the Pittsburgh Pirates, Morneau signed with the Rockies and enjoyed an outstanding comeback season in 2014. The left-handed hitting first baseman, who won the American League MVP Award in 2006, secured his first batting title (.319) last season. In doing so, he became only the third Canadian (along with Walker and Tip O’Neill) to accomplish that feat. A participant in last year’s Home Run Derby at the all-star game, Morneau led Canadian big leaguers in most offensive categories in 2014 and was second amongst National League first basemen in slugging percentage (.496) and on-base plus slugging percentage (.860). His offensive output catapulted him into second place amongst Canadians in several all-time offensive categories, including hits, RBI, doubles and total bases. On top of his offensive accomplishments in 2014, Morneau was a Gold Glove finalist, a NL Comeback Player of the Year nominee and he finished 24th in NL MVP voting. He was also selected to suit up for a post-season all-star team that travelled to Japan. Off the field, Morneau and his wife, Krista, are active in numerous charities. For the past six years, they have organized a Casino Night to raise money for the Arthritis Foundation, a cause that’s close to Morneau’s heart because his niece, Madelyn, suffers from juvenile rheumatoid arthritis. Also in recent years, the couple has spearheaded the Winter Warm-Up Coat Drive for the Salvation Army in Minneapolis. Last year, they collected over 1,500 coats for people in need. The New Westminster Firefighters’ Charitable Society, the Starkey Hearing Foundation and the Ronald McDonald House are among the other charities that Morneau has supported in recent years. For his humanitarian efforts, he has been nominated for Major League Baseball’s Roberto Clemente Award three times (2010, 2012, 2013). Russell Martin (Montreal, Que. ), Dalton Pompey (Mississauga, Ont.) and James Paxton (Ladner, B.C.) also garnered significant support for the award, as did Team Canada Women’s MVP Stephanie Savoie (La Pocatière, Que.) and Jamie Romak (London, Ont.). The Hall’s Tip O’Neill Award is named after Woodstock, Ont., native James “Tip” O’Neill, who was one of Major League Baseball’s first legitimate stars. With the American Association’s St. Louis Browns in 1887, O’Neill set big league records in hits, doubles, slugging percentage and total bases, while compiling a .492 batting average. Walks were counted as hits in 1887, but if O’Neill’s average was calculated by today’s standards, it would be .435, the second highest single-season average in big league history to Hugh Duffy who hit .440 in 1894. Great article Kevin. thank you. A great honour to present this award to Justin on Monday. Have fun on Monday, Scott!